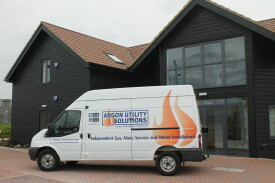 Argon Utility Solutions Ltd is one of only sixteen Independent Gas Infrastructure Providers registered on the Lloyds Register for both domestic and commercial gas installations throughout the UK. With over 40 years’ experience in the Gas Industry combined with dedicated teams of Engineers, Consultants and Utility Associates, we have amassed an extensive knowledge base of the utilities industry with which we work to provide the best possible service. We are a privately owned company based in Bedfordshire with fully qualified installation teams and engineers whose sole aim is to deliver projects within time and within budget to the highest of standards. As a privately owned UIP we have the agility to beat the price of any of our competitors and can be on site within six to eight weeks of initial discussions for optimum client satisfaction. We can provide bespoke gas installations through Design, Installation and Network Connection leading to the final Meter Installation which upon completion is adopted by the local Gas Network. Our customers are our priority and as a potential client, your satisfaction is our first concern in all works we provide- all your views and input will not only be considered but held of paramount importance in our service to ensure you will not receive a better service anywhere else.